A masked gang stabbed a man to death in his home in a "carefully planned and violent raid" to rob him of drugs and money, a court heard. 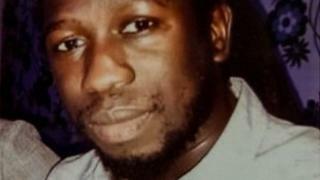 Cannabis dealer Tairu Jallow, 29, died after being stabbed multiple times at his home on Havelock Street, Kettering, Northamptonshire on 14 January 2018. Northampton Crown Court was told the gang "smashed their way in, got what they came for and stabbed him". Four men deny Mr Jallow's murder and conspiracy to commit robbery. Opening the case, prosecutor Karim Khalil QC told the jury that the defendants - Babacarr Sylva, 32, from Nottingham, and three men from Birmingham - Kausu Ceesay, 24, Clever Makande, 24, and Ngange Sowe, 30 - were "involved with drugs, specifically cannabis". He said: "It was a carefully planned and violent raid on his home to rob him of drugs and cash - it is likely others were involved as well." The court was told that some of the gang went through the front door while others broke in through the conservatory and kitchen at the rear of the house. Mr Khalil said the gang were wearing "masks and hoods tightly held over their heads" and during the raid Mr Jallow was stabbed multiple times. "We don't know who stabbed him - possibly it is not one of the four men in the dock," he said. "But we say these four men were part of a group of men each of whom played his part in attack." Mr Khalil alleged Mr Ceesay and Mr Sowe were part of the group that went into the house and Mr Makande and Mr Sylva were the getaway drivers, and possibly one, the other or both may not have left their vehicles.